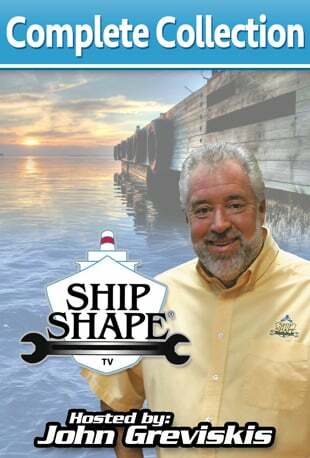 DESCRIPTION: In this half hour John covers the gamut of different types of rails for your boat. A tow rail is installed on the Bertram Moppy for safety issues and Bow rails are discussed and compared with new versus buying surplus. DESCRIPTION: Real boat re-construction is featured here in the packed half-hour. This time the G-Man uses pre-fabricated stringers to heighten the stringers on his Seabird project boat. After that, it’s all about gas tanks and what type to choose for this particular craft. Join john as he makes some rather important decisions for this restoration. DESCRIPTION: No matter how much you flush your engine the traditional way, it just doesn’t completely do the job to remove all salt deposits in your engines. This episode deals with this big issue of boating by introducing an internal flushing system called MST Guardian. DESCRIPTION: On the 1976 Seabird project boat, many of the deck accessories have been glassed into the grid system and now its time to actually make some of them work. This episode deals with what it takes to do some plumbing in your boat. DESCRIPTION: We are continuing on the Rigging of some new Yamaha engines on the ACB project boat. While we are discussing that, John will invite Excide Batteries to talk about the various choices boater’s have when it comes to powering their craft! DESCRIPTION: For all you boaters interested in changing their older boats from Gas engines to Diesel… listen up! Here on Ship Shape TV, John is doing this conversion on his 1973 31′ Bertram, the engines have already been removed, and now its time to reconfigure the engine beds so that it will accommodate the new diesel engines. Real boat construction stuff here.. so tune in! DESCRIPTION: John takes us on a guided tour on how an aluminum tower gets fabricated. Then he gets into the exciting world of making a part for a boat… specifically how to form it from a mold! DESCRIPTION: In this particular episode, John wants to mount an combo unit inside the ACB. He doesn’t have much room to do so… so some fabrication will be necessary. While on the subject of fish finders… John wants to discuss transducers.. particularly the through hull kind. DESCRIPTION: Ever wanted to design an upper control station for your tower accessory? Well in this show, John fully discusses the additional items it will take to complete the job. A new type of electronic control throttle is discussed and also how and where to mount the additional steering for this new upper station. DESCRIPTION: Do you have a piece of teak trim in your boat that has cracked and looks awful? In this educational episode John shows you how to patch that valuable trim so that you may continue with your bright work like it was new again. Also learn how to make some teak trim from scratch. DESCRIPTION: This episode deals with making and installing a canvas enclosure. Then, in order to attack some nasty stains on your boat, a professional boat detailer comes in to educate. DESCRIPTION: John installs a new 70HP Outboard to his newly purchased ACB and goes over the various steering options that are available for him in this repower. DESCRIPTION: John continues with the blister repair of his Bertram Moppy by doing some cosmetic fiberglass work and fairing it in. In this mechanic episode, John replaces the exhaust manifolds and risers to an engine that has overheating issues. DESCRIPTION: On the 1978 Stamos… john paints in a boot stripe to jazz up the boat a bit. On the Bertram Moppy, John finishes with the blister repair by using special high build primers and finish paints to completely mask that any wrong was there… He also gets into some painted in non-skid. DESCRIPTION: John completes a transom enclosure by fabricating a transom gate so that the new enclosure can be easily boarded or exited. Then John builds a transom cap made of teak wood that will blow your mind how beautiful and practical it is! DESCRIPTION: John switches out some impractical seating on one of his project boats and, while he is at it, he also discusses the various types of seating and seat pedestals out there to choose from. DESCRIPTION: In this episode, John removes a buildup of anti-fouling paint in order to replace it with a new coat. DESCRIPTION: In order to simplify things greatly on your boat, John teaches us how to switch from the old fuse technology, finding and replacing fuses and such, to circuit breaker technology. This major electronic transformation will make fixing blown circuits as easy as flicking a switch!